Hawaiian monk seal with pup. Photo courtesy of Pat Greene, National Geographic Society’s Remote Imaging Department (www.nationalgeographic.com/crittercam). The Hawaiian monk seal’s common name is thought to come from the folds of skin around its face that look like a monk’s hood, and/or because it spends most of its time alone or in very small groups. Its traditional Hawaiian name is `Ilio holo I ka uaua, meaning “dog that runs in rough water.” Hawaiian monk seals are only found in the Hawaiian Island chain, with the majority of animals located on the sandy beaches and in the waters surrounding the Northwestern Hawaiian Islands. 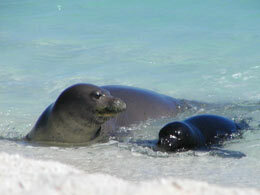 Monk seals feed primarily on benthic fishes and invertebrates both within atoll lagoons and in deeper, offshore reefs. Common foods for monk seals are small reef fish, flatfish, larval fish, spiny lobster, eels (except conger and moray), and octopus. Females grow slightly larger than males and display more variation in weight. Adult females range between seven and eight feet in length and 400 to 600 pounds in weight while adult males measure approximately seven feet and between 300 to 400 pounds at maturity. Although protected as an endangered species, Hawaiian monk seals remain one of the most endangered of all seal species.Hawaiian monk seals vocalize throughout their life. Pups utter “mwaa, mwaa, mwaa” and, when disturbed, an explosive “aaah” or “gaah.” An alarmed adult sound consists of a “bubbling” that originates deep in the throat (with the mouth either open or closed). The bubbling resembles that of water being poured from a jug. Hawaiian monk seals are also known to make a more growling “wup” sound – sometimes brief, sometimes drawn out (like that of the second vocalization made by the adult male seal while ascending from a dive) – both above and below water. 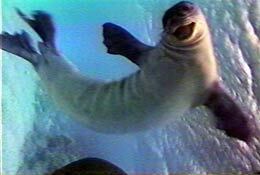 This is a still frame from a video of a male adult monk seal harassing a juvenile. The camera, part of the Crittercam system, is on the back of the adult seal and the photo is of the juvenile that is being harassed. This image accompanies the first vocalization listed below. Photo courtesy of National Geographic Society’s Remote Imaging Department (www.nationalgeographic.com/crittercam).